Sorry for the lack of updates. I've been working full-time everyday, so I come back pretty exhausted. I still haven't fully recovered from finals week either. So far, I'm loving my job, so I don't mind spending my days in the office. The first day, we went out to lunch at Kokkari Estiatorio, which I had wanted to go to for a while. It was good, but not as great as I had hoped; more about that later. The Ferry Building is 5 minutes away from my office, so I've been visiting pretty much every day. I couldn't have asked for a better location to work. 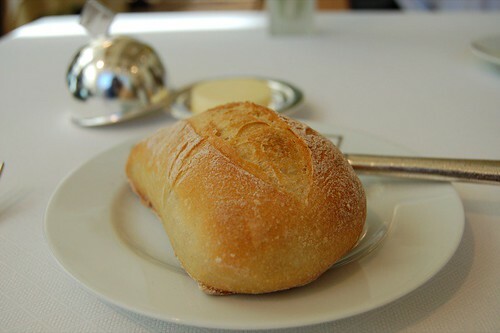 But before I start on SF eats, I will just finish up two more posts on NY: Jean Georges and Le Bernardin. 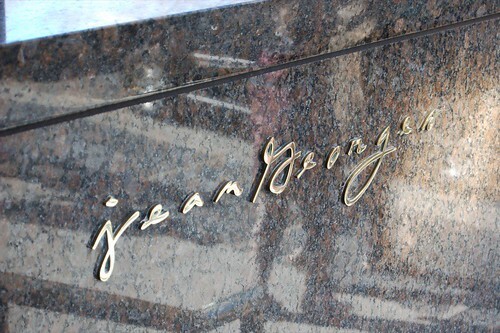 Jean Georges is a New York City establishment located on the ground level of the Trump Hotel. The restaurant is split into the main dining room and Nougatine, the "casual" dining area. The particular meal I had was during lunch in the main dining room. The amuses were all great. 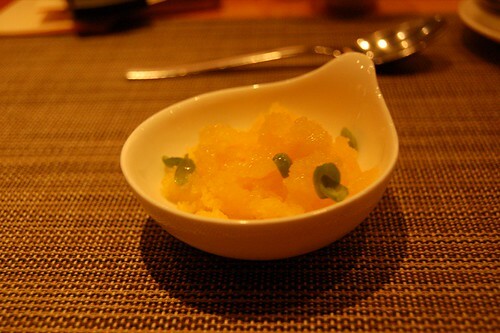 The sea urchin was sweet and creamy, and the bread added a good crunch. The jalapeneo, which was quite Nobu-esque, added a good savory and spicy touch. The best thing about the fennel soup was that it had a dollop of green and grassy olive oil. And of course, the bread was great. 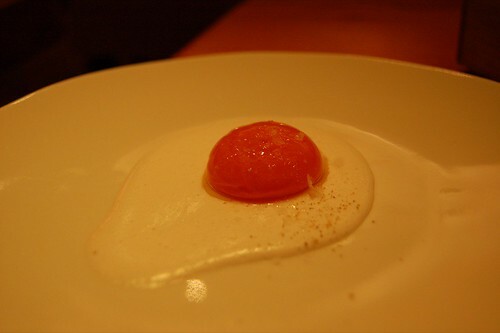 The first course was a Vongerichten signature, the famed egg caviar. The egg is loosely scrambled, then topped with a whipped cream seasoned with vodka, salt, and pepper. 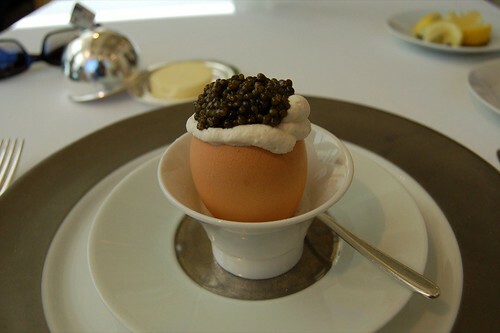 Then it is topped with a generous scoop of caviar. It was a good contrast of temperatures (hot egg, cold cream) as well as textures. Quite indulgent and super delicious. My taste buds were pretty saturated that morning, so I opted for something light-ish. 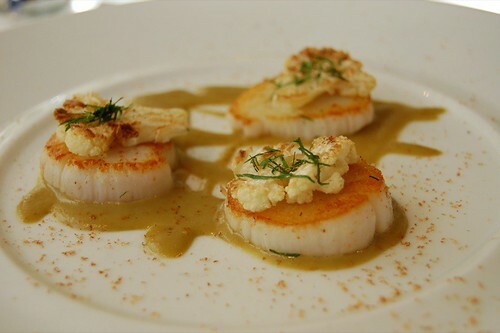 The scallops were good, but pretty typical of a seared scallop dish at a good restaurant. As a sucker for tarts and citrus and honey, I was compelled to choose this theme. 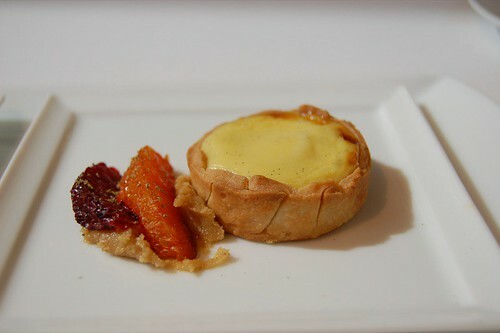 The tart was crumbly and buttery, and the filling was smooth and had a very intense honey flavor. 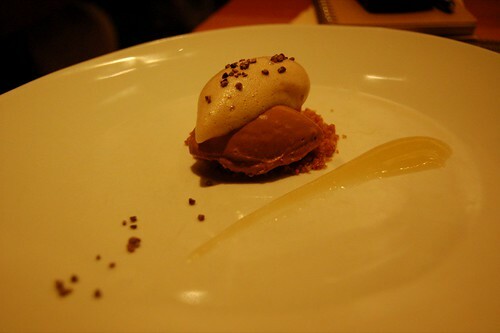 The walnut butter was a bit too rich, even with the tart citrus slices. The compote was just alright. The star anise was too overpowering and the cooked+syruped fruit/honey combo/sweet almond tuille combo was way too sweet. I didn't even finish this. 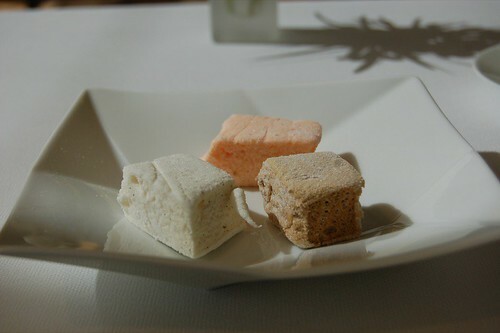 Homemade marshmallows are cut tableside. I liked the original one the most. 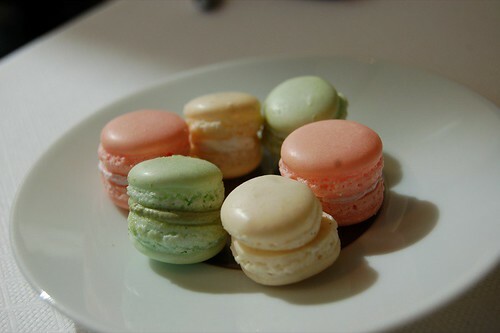 Macaroons were all good. Light and airy with just the right amount of cream. 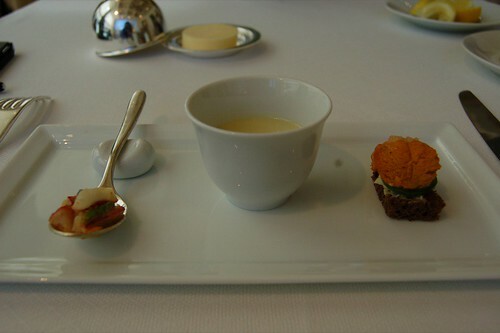 I can't really say my lunch at Jean Georges was spectacular, but that may be because of the items I ordered. 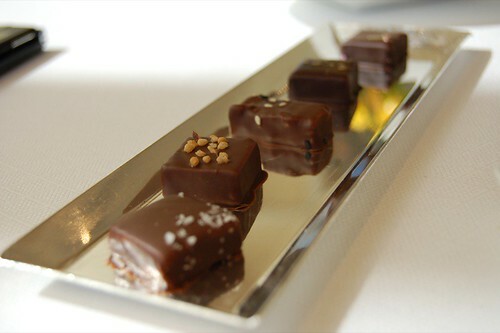 Le Bernardin, a comparable restaurant in terms of price, was a much better experience. I am curently blogging from the 415. School has finally ended, so I'll be in the Bay Area this summer for my internship. It starts Monday, and so do power lunches in the Financial District. But before I start on Bay Area posts, I'll finish my winter break eats. Gosh, I'm so bad with updating. 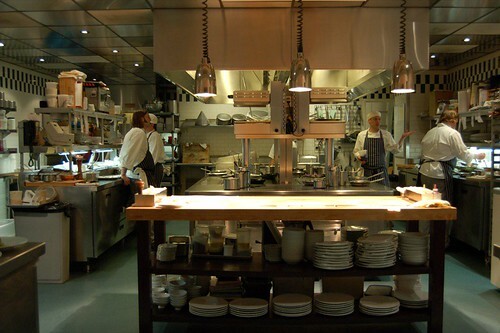 One great meal was at wd-50 on the Lower East Side. 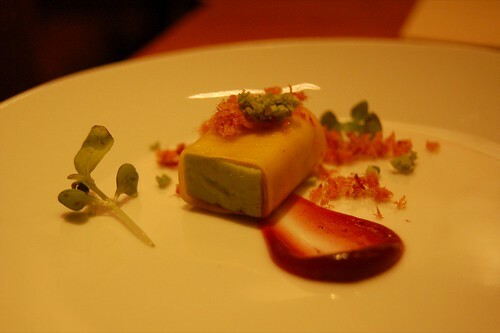 It's a restaurant in the molecular gastronomy league, fusing science with haute cuisine. 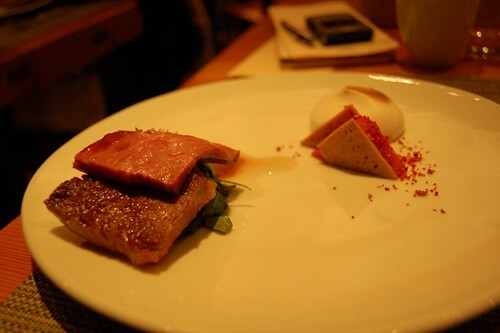 Wylie Dufresne is known for his extensive use of transglutaminase, an enzyme that binds proteins, throughout his menu. I was quite excited to taste everything, so I went with the tasting menu. Dufresne replaced most of my dishes on the regular menu with specials, so I got to taste some of his more unique dishes. We started off with some sesame crisps. Quite addictive and light. I could munch on these all day. This amuse was just alright. 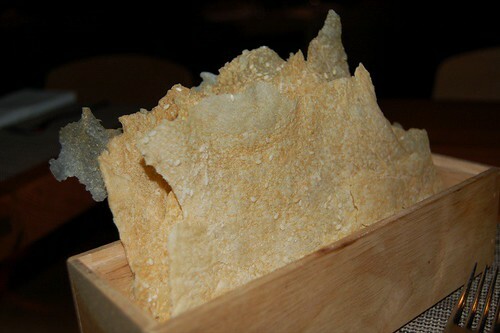 The salmon threads are similar to Chinese dried pork threads used in Taiwanese sticky rice and various breads and pastries. The dehydrated edmame wasn't too flavorful, and the pancake covering was kind of limp. There were too many elements competing with each other. All I could say about this was just that it was "different." This is one of Dufresne's signatures. I was impressed by how visually accurate the coconut juice and carrot-juice dome were; I was even more blown away by how the textures were almost identical. Popping the carrot, the juice oozed all over the plate. Very fun to eat. 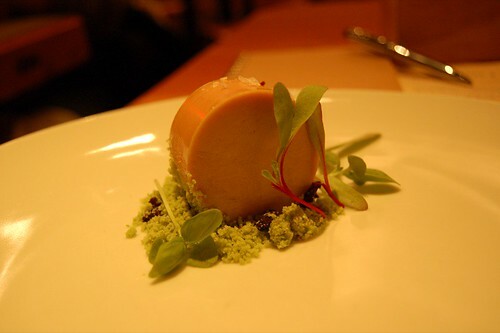 Another one of Dufresne's signatures, this foie gras is well deserving of its fame. The greatest part (besides eating it) is cutting it open and having the beet juice ooze out. 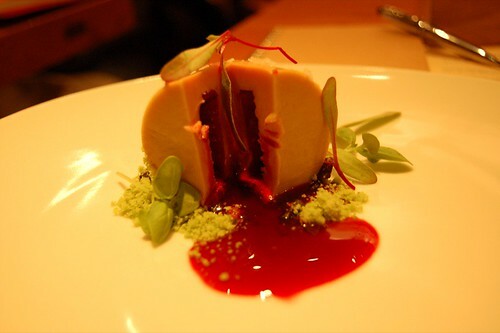 The foie gras was creamy and rich and went amazingly well with the beet. The candied olives were delicious too. This was another interesting one. 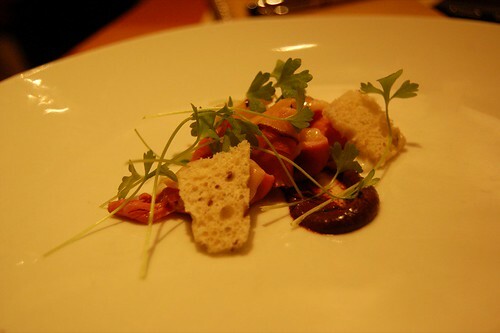 The octopus confit was done perfectly, tender and juicy. The pesto was a bit overpowering, though. 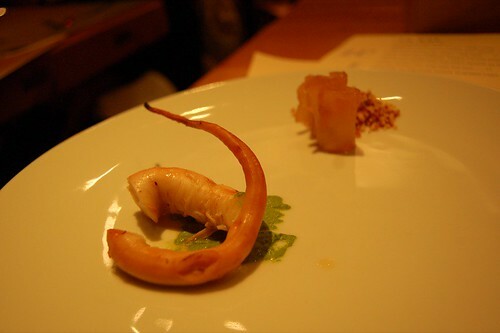 Asian celery is extremely strong, and it's "raw" flavor masked the sweetness and smokiness of the octopus. The poached pineapple and almonds were nothing too special. I didn't really find that it went especially well after the strong celery aftertaste either. A great take on a NY classic. All the elements worked perfectly, but nothing too special to report. I did run out of the rye crisps before the duck, however. I want my carbs, dammit! At this point, we were allowed to "make our own food." 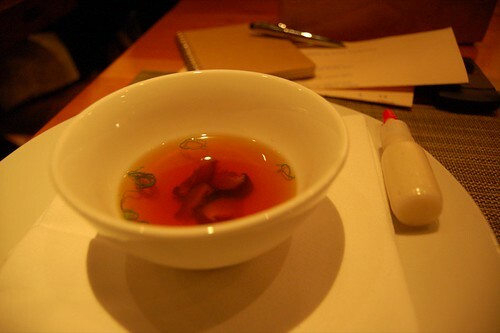 We were presented with a double clarified, super hot bowl of dashi, along with a tube of a tofu+sesame mixture. As you squeeze the mixture in, it solidies into noodles in the soup. 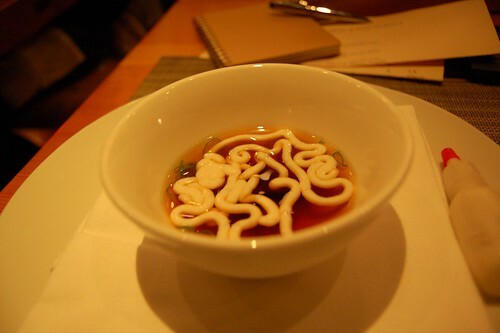 The noodles have a melt-in-your-mouth quality and a sweetness that complements the savory dashi well. Pretty innovative, but I had already something similar in Hong Kong. The only difference is that the noodles in HK were a mixture of minced fish and other flavorings. I guess that sort of ruined the wow factor for me. This was one of my favorites. 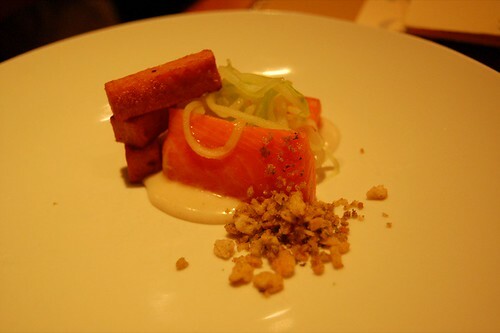 The lightly cooked trout was super-rare and tender. The cucumber noodles were a nice marriage of taste and texture: cool and refreshing like the vegetable, yet quite chewy like a nice al dente pasta. 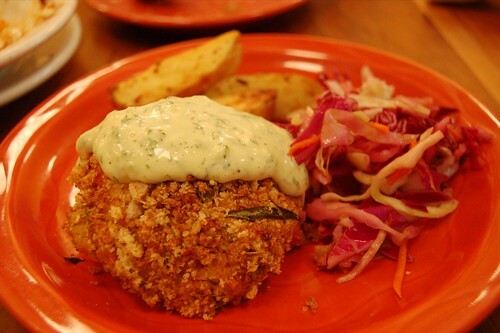 The same treatment goes for the pita puree and falafel crumbs. I wasn't too crazy about the tomato/chick pea cakes. The 21-day aged sirloin was wonderfully flavorful and rare, but less tender than I preferred. It rested on a bed of water spinach, which was way too salty given it also absorbed the fine juices of the beef. The horseradish was superfluous, since it would mask the flavor of the beef. 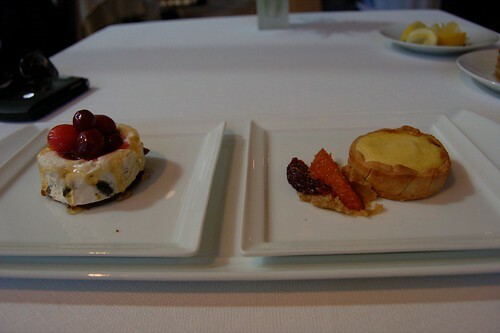 I really enjoyed the red pepper "tarts," which were actually a buttery crisp with a red pepper cake. This was an excellent palate cleanser. So smooth and citrusy. This would be great on a hot summer day. I wasn't too impressed with the first dessert. 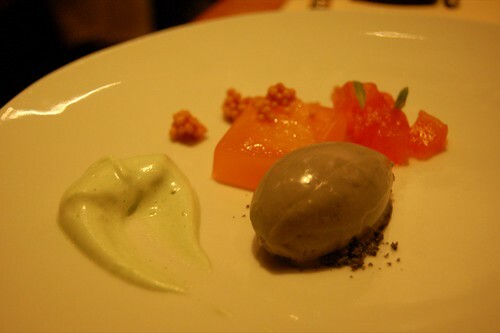 The tart grapefruit didn't go too well with the sesame ice cream. The grapefruit gelly was strange and slippery, and just didn't work for me. There were also these toasted rice bits that seemed out-of-place and unnecessary. 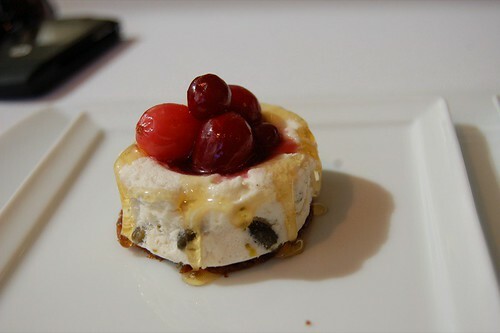 Sam Mason redeemed the meal with this wonderful dessert. The chocolate was so intensely dark and rich. The strong stout foam worked extremely well with the banana and chocolate. 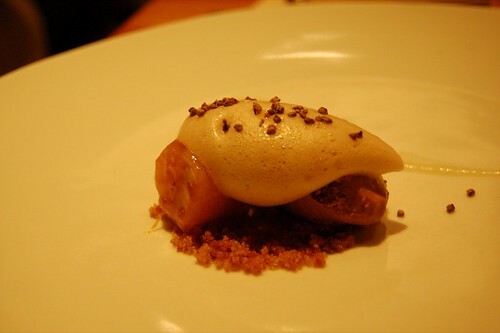 The taste of this dessert stayed with me long into the night; I still remember and savor it. A close-up since it was delicious. 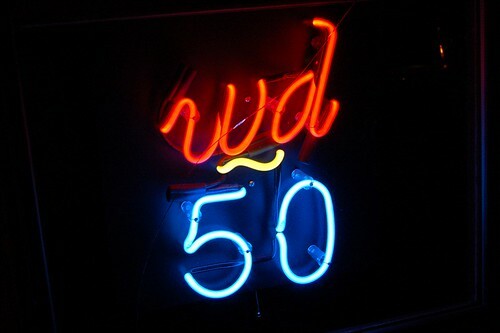 Overall, I enjoyed my meal at wd-50. Not every dish worked; I think Dufresne overextended himself in the innovation factor and things got too complex and even silly. However, it is definitely a restaurant you leave with an experience. Many, if not most, of the stand-out things I ate during spring break was from this meal alone. Sooooooooooo I haven't been diligent about posting. It's currently finals week, which means I need to get my act together and make up for all the missed classes and things. Among other things I've learned this week (but should have learned long ago since this happens every time): don't start on a semester long research paper 3 days before it is due; don't start learning accounting the day of the final; and go to ALL my classes. I will rectify that by procrasting yet again. 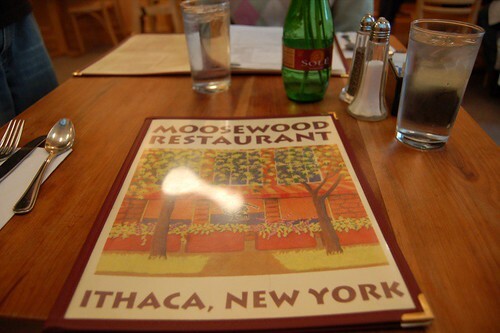 Moosewood Restaurant, founded in 1973, is an Ithaca institution famous for driving the vegetarian cooking movement. 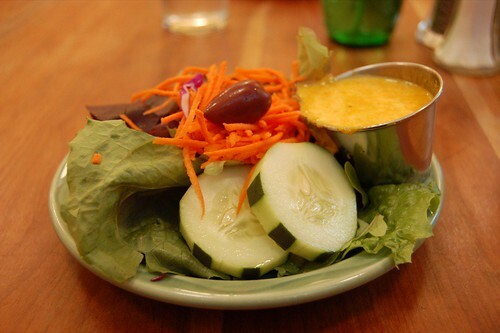 It emphasizes natural and locally grown ingredients and has a daily rotating menu. It's similar to Chez Panisse, but with lower prices (and a crappier location). This would be my first visit; I had been deterred by all my college peers' bad reviews, but they mostly complained how it was very vegetarian. I guess they just prefer their burgers. Even the menu looks natural. Or maybe it's just the Greek-y type? I really enjoyed the dressing. Even without oil, it was very smooth and creamy; it was also quite gingery, garlicky, and vinegary. 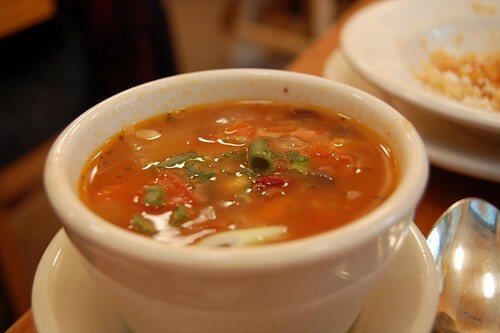 Pretty much your basic chili-tasing soup. I liked how it wasn't too salty or starchy. There were these really juicy tomatoes that just burst in your mouth. This dish was kind of blah. 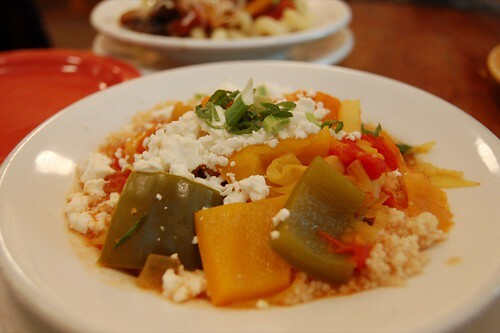 The stew was a bit too sweet in general; a bowl of sweet vegetables isn't too exciting. I really liked the veggies of the entree. 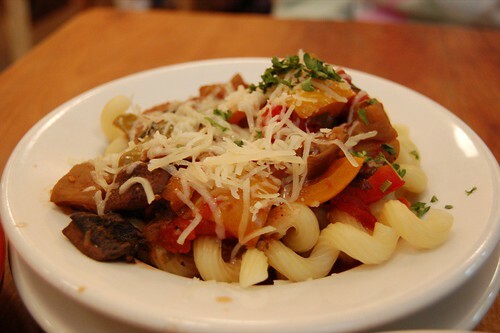 Everything was super juicy, and the mushrooms were especially aromatic. I also liked how the sauce wasn't too salty nor viscous. I would have preferred the pasta more al dente, though. Overall, this was a delicious yet healthful dish. This was probably the best of all three. 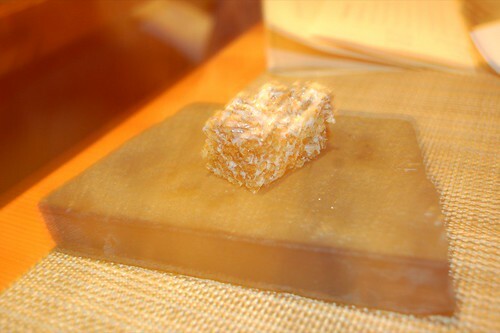 The cake had a crunchy exterior and a creamy, soft interior. The salmon wasn't fishy tasting from the salmon, since the merepoix helped balance. The aioli, however, overpowered the cake so we just brushed it to the side. The potatoes were roasted simply with brushed olive oil and some garlic. The cabbage slaw was really good too; the red cabbage was crunchy and fresh. Since I am very fond of certain vegan baked goods (Babycakes! 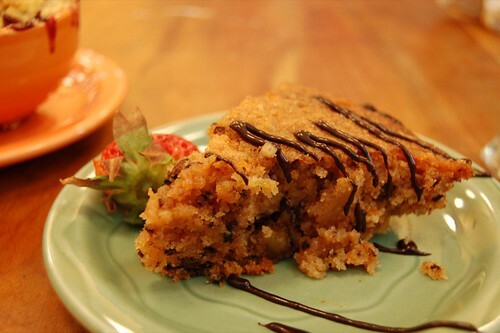 ), I decided to try this vegan crumble. The innards were a bit sweeter and syrupy than I expected, but not bad. 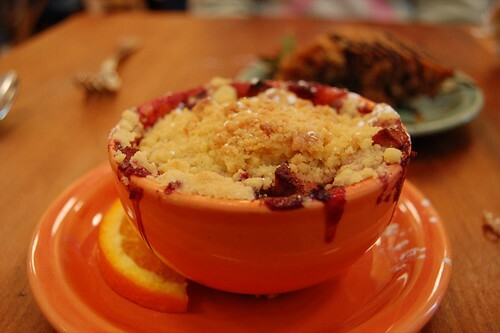 The crumble had great flavor even with the absence of butter. I was impressed. This yogurt cake was better than the crumble. It was very moist and surprisingly light. It had an interesting texture without being cakey. The citrus accent was very refreshing, and the bits of walnut gave it a strong nutty flavor. The chocolate drizzle was a bit competitive and superfluous, though. 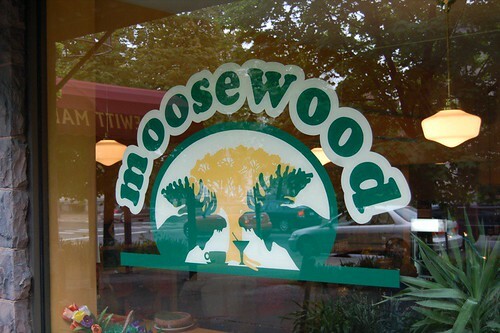 Overall, I really enjoyed my lunch at Moosewood. Everything tasted very healthful and I left sated and not overwhelmingly full. So, we then proceed to fulfill my muffin craving since I didn't go to Babycakes afterall. 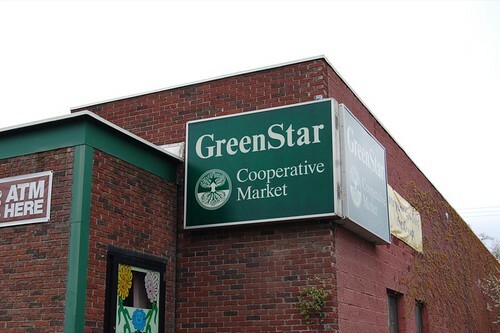 GreenStar Coop is a natural food store which carries a lot of locally grown produce. I like it because of its wide selection of organic baked goods and the fact that they carry Wallaby yogurt. I bought an applesauce cranberry muffin with lots of texture. I love textured muffins. Along the way back to the Commons, we passed by several Ithaca-esque buildings. 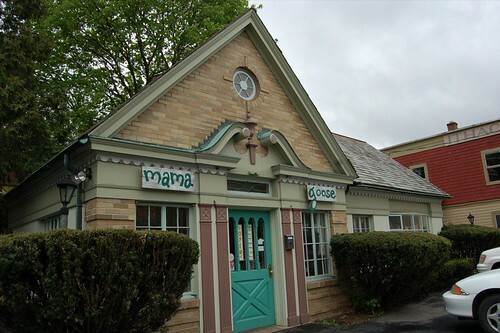 Mama Goose is a second-hand children's clothing store. It's all very cute, but I don't really see a market for it here. It's one of those anachronistic little gems that would work in a big city. 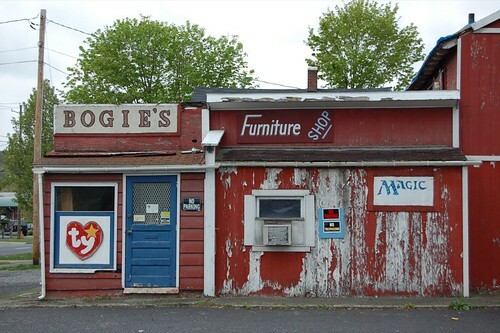 This was a scene that screamed Middle America. I wonder if it's a furniture store..or a toy store? And who's Bogie? It also reminds me of one of those scary toy stores from Are You Afraid of the Dark (best show ever). 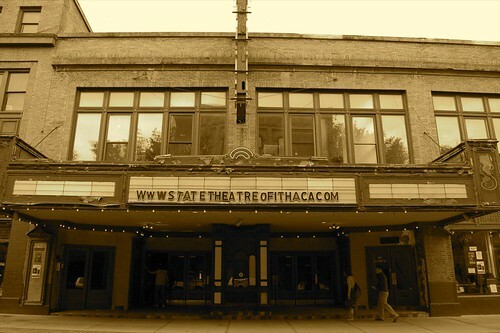 State Street Theater--in sepia, no less! Home on Thursday the 18th!